We repair or duplicate the following brands: Rayner, Loop-loc, Merlin, Anchor, Meyco, Cantar, and more. Your pool's winter safety cover needs replacement or repair. Your search is over! D.S. Sewing, Inc. will repair holes, chafe strips or other damage. Or match the straps to your concrete anchors bolts and duplicate your inground pool cover EXACTLY. 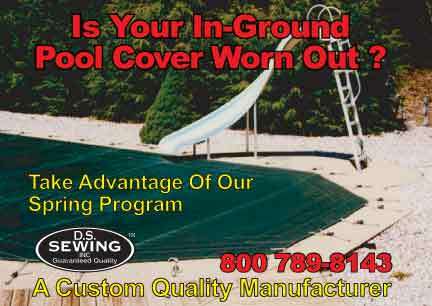 We use only the highest-grade commercial fabric to make our residential pool covers. Make sure the cover is clean for mold and mildew. Take photos of your cover. Attach your contact and return shipping info into the box. We will call you when your cover arrives. On the phone together we will review the condition of your cover. Or come in between 9:00 to 3:00, Monday to Friday. Call first to make sure we have open floor space. Plan on spending an hour here for opening, inspecting, and pricing your cover. "IF YOU CAN IMAGINE IT, WE CAN SEW IT!" D.S Sewing now stocks the most popular pool covers. Click here to see the sizes and purchase your cover online. Our materials and construction features are of the highest quality. Enter your measurements into the custom plot program.